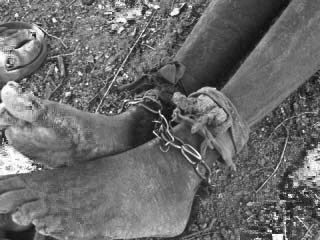 Chained for 20 years, offered only an average of 250 ml ( small tin of coke) water a day , if there was any, in scorching heat of up to 38 degrees in the summer and even 28/29 in the winter. She was no Witch but only a grandmother living with Dementia. ADN had the privilege to unchained her on the 12/12/12. That day we bath her in 30 liters of water and every day after that Koos Verwey made sure that she had enough water to drink, wash herself in and for the caregivers to prepare her food with. 7/9/16, 5:45:37 PM: Berrie: , 9 July 2016, is another historic day for Ndjinaa and ADN because when the sun will set tonight the 5, 000 liter Jo-Jo water tank in Ndjinaa’s village ( Mbakutuka Komapando ) will be filled by her own borehole next to her village. it’s own borehole and water tank with enough water in which she can swim if she like to. Sometimes live pull a trick on the powerful. The men and women who think that they are the untouchables in society. First look at the picture. Do you see the old man in the middle of the picture with the red and white cap and the blue skirt around his waist? That is Chief Kapika. The man who are able, according to their believe, to hear you gossip about him 500 km from him. The one who is so powerful that he can sent the spirit of dead people to possess any family member he choose. Because of her being bewitched ( dementia) she normally walked into the woods to collect fire wood, but was not able to find her way back. In order to save his own life he chained her. But than also the spirits which he send to possess in her one night attacked him. from that day she was more than bewitched, she was the Witch! 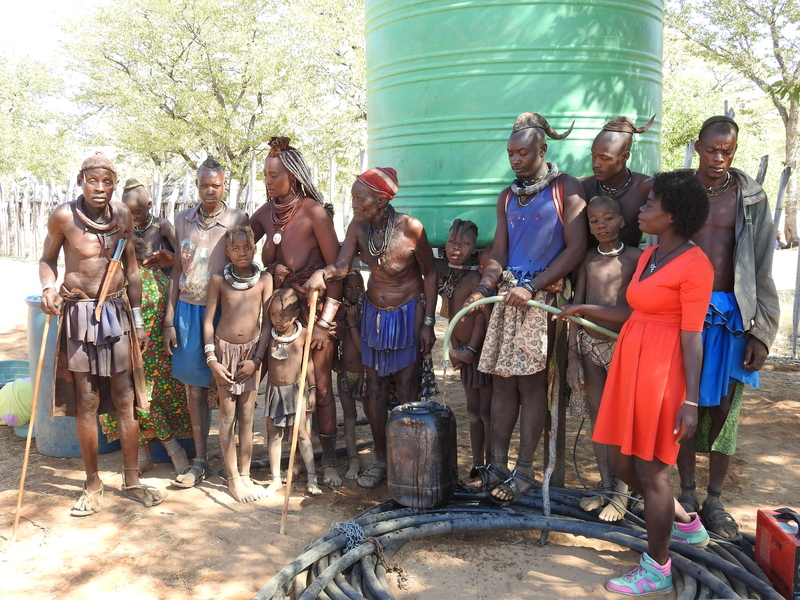 For 20 years , if there was water in Kapika’s village ( Omaramba ) she received maybe 250 ml of water. Yesterday, 9 July 1016 ( the picture was taken yesterday) the powerful , 84 , Chief Kapika, walked from his Village -about 500 meter ) to Chief Ndjinaa’s Village ( Mbakutuka Komapando ) to receive water from the 5000 liter water tank with the blessings of Ndjinaa. I love this story. I am happy for Ndjinaa and thankful towards God our Creator and people like Koos, Paul, Michaella, Prof Reimer and all the other donators that I didn’t even know and forgot. ← Would you not be afraid of being accused as a WITCH? What a powerful story. Well done to all that had a hand in her being unchained! I live in Ghana and the people here also have difficulty dealing with illnesses of the mind. Many people are brought to so called faith healers to be chained for years when the family cannot deal with ill family and friends. The situations and abuse those in chains suffer is unmentionable. This is a very sad story. I hope Namibia creates a law that would protect people like Ndjiina.